For days I’ve wanted and not wanted to write. The words and sentences were swirling around in my head, but I could not bring myself to take out my laptop. I feared that writing those sentences would propel me closer to the depths of blackness. My selves were vacillating between wanting an end, and not wanting an end. When I’m in a situation such as this the best thing to do is nothing, and that is what I did. I simply fell asleep in a dissociative state around 7 pm. We saw Doc yesterday, and discovered a new self. Honestly, for some reason, I don’t care for the term “alter.” Since Doc says they are all a part of me, I shall call them selves because I can. I was late for the appointment because I got lost on the way. There is no good reason for this as I’ve been there many times. Sure enough, Doc figured out that someone else was taking over, and out tumbled, Secret. Secret is young, though I can’t figure out her exact age at the moment. She is terrified of highways and heavy traffic. Apparently, this appears to be the reason I have so much trouble getting to his office on time, or losing my way there at times. She recalled instances of horrifying car rides with my stepfather. Even now, I feel myself slipping away because I don’t want to remember. I don’t want to remember the feeling of impending death from his careless and thoughtless acts behind a wheel. He loved to scare us in the car. It seemed like Secret was around for the scary car situations, but Belle would appear when the horror turned to feelings of death. Belle holds the worst of the feelings, the feelings of wanting the pain of existence in that household to end. Belle, for the most part, just knows despair, no hope, and a desire for an end. Doc’s theory is that Belle exists just for that, to hold the worst of the despair for all the others. As Secret started to recall the scary car experiences to Doc, Belle appeared when it became too much for Secret. Belle has this defeated sounding voice that breaks my heart. As she tells Doc that she wants to die, he comes and sits right in front of us. We are almost toe to toe. He starts to ask her to think about what it must be like for a psychiatrist to lose a patient to suicide, knowing that his patient gave up on life. He also told Belle that we don’t know what it’s like “on the other side” so stay here, and keep trying. 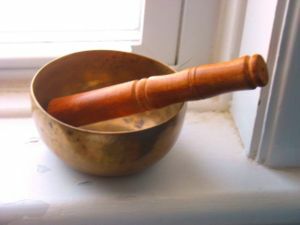 He then went over to his desk, and picked up a singing bowl, of which I had never seen in my life. He touched it on the side with wooden mallet, and it let out this peaceful sound that I can’t even describe. Belle asked if she could play it herself, and he allowed her to do so. Then as quickly as she felt the joy of the sound of the singing bowl, she found herself feeling like throwing up. Apparently, the good feeling was so new, and so foreign that she nearly became sick. We were then in and out of a dissociative state for the next 12 hours. We have now come out the other end and survived, but we are tired. The singing bowl sounds amazing! Thanks for sharing your therapy experience, I could really relate to it. some of my therapy sessions are pretty similar. It’s comforting to know that others are experiencing the same kinds of things. Thanks for commenting! It’s a comfort to know that my experiences are not unique. Many, many thanks! Hi Bourbon, I was starting to feel the same way, that the term “alters” was to stigmatizing. Thanks for your patience with me, as I’m not a consistent presence on the blogs.